Thus, this type of critique leads scholars to see microfinance as a tool that elevates the standard of living of those in poverty, without necessarily drawing them out of poverty, by giving them access to credit that they would not be able to obtain otherwise, due to their lack of collateral and the small loan amounts. Yet, the very small scale of these micro-funded activities is not conducive to actual poverty alleviation; instead, creation of stable jobs is necessary. Therefore, I was particularly interested in seeing microfinance in action in Auroville, and have been presented with multiple opportunities to do so over the past 10 days. In our visits to different microfinance and social enterprise organizations in and around Auroville, I was fascinated to see this critique being embraced in innovative ways. WellPaper doesn’t simply form groups of women to receive loans, it provides a structured training in the making of high quality products from recycled materials. Instead of sending the women out to create their own individual crafting enterprises, WellPaper acts as a collective buyer for the women, who can work individually or in teams to fill the orders that WellPaper receives. This provides reasonably steady employment for the women, though there are busy and slow order periods, and allows WellPaper to sell and market its products all over India and abroad. The Auroville Village Action Group (AVAG) has touched the lives of over 4000 women through microloans and women’s groups and, while continuing to expand their microcredit programs, is investing more and more efforts in opening business lines that provide stable jobs that build on the skills that their loan recipients have acquired. They now have lines selling environmentally friendly feminine protection, clothing and jewelry all over India. Thus enterprise development is building upon initial microfinance and education efforts. Naturellement goes even farther than providing stable jobs; indeed, its founder argues that this is not enough, and that educating her employees on personal finance and providing a community in which the women can discuss issues such as domestic violence is also necessary. The People’s Social Development Foundation (PSDF) does focus on self-employment micro-enterprises, and the effects of this do indeed seem to tend more towards “softening the blow” of poverty rather than alleviating it. However, this is not to say that this is not useful. PSDF’s microfinance efforts have made great gains in freeing families from crippling debt to local moneylenders and empowering women in non-economic ways, through providing counseling and social forums to discuss domestic violence and women’s political and communal leadership. 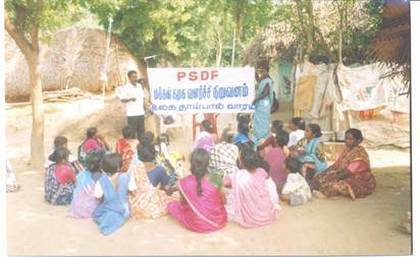 PSDF conducts awareness programs and group counseling in the 47 villages that it works in, as well as providing microloans. Thus, while it is important to take critiques of microfinance into account, criticizing microfinance’s ability to alleviate poverty does not mean that microfinance is a completely ineffective tool. Opening large enterprises that provide stable jobs is not always feasible in the short-term, especially in rural areas that are not attractive to investors due to a lack of skilled workers. Indeed, both AVAG and PSDF note that, while the microfinance approach may not pull its recipients out of poverty, when coupled with education initiatives, it provides a basis for further quality of life improvement in future generations and a stronger foundation for present and future skills acquisition, thus creating a more attractive environment for larger, traditional investors in the future. These organizations see less children being taken out of school to work and less interest and trust in financing from moneylenders. Auroville has thus demonstrated to me how both microfinance and enterprise building can be used as a package to empower and alleviate the poverty of developing communities. There is rarely a true “silver bullet” in development; rather, development practitioners need to draw from a toolkit of multiple tools, depending on the specific situation at hand. While the Auroville context, from my observations, provides further evidence that microfinance is not necessarily the best tool for rapid poverty alleviation, and the power of enterprise building and job creation to do so instead, it also demonstrates the power of microfinance coupled with social and economic education to lay a foundation for skills acquisition and women’s non-economic empowerment, which may ultimately create a more conducive environment for larger scale job creation in the future. Stay tuned as I begin my work with the People’s Social Development Foundation for these next two weeks and explore this topic and the power and shortfalls of microfinance in more detail! Banerjee, A. V., & Duflo, E. (2006, October). The Economic Lives of the Poor. . This entry was posted in Economics, Non-Governmental Organizations (NGOs), Sustainability, Women's Empowerment and tagged AUP, Auroville, microfinance, NGO, poverty, social enterprise, Sustainability, women's empowerment by aupindia. Bookmark the permalink.